Belle Sparks McKenney was the daughter of James Sparks and Carrie Burch, and wife of George W. McKenney Jr.
Belle M. SPARKS, daughter of James and Carrie SPARKS, was born January 14, 1868, in Shelby County Illinois, and departed this life, December 28, 1935, at the home of her son, J. A. MCKENNEY in Sedan at the age of 67 years, 11 months and 14 days. She, with her parents, came to Kansas in 1873, where they settled on a claim on Limestone Prairie, where she lived until June 3, 1883, when she was united in marriage to George W. McKENNEY at Elgin, Kansas. 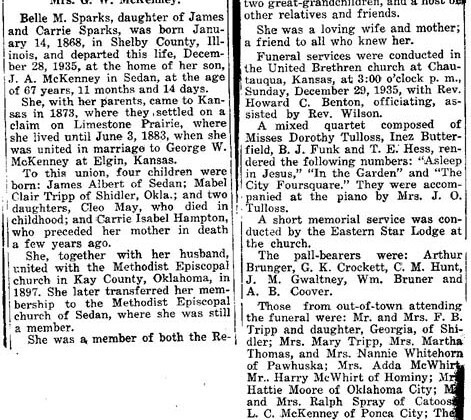 To this union, four children were born: James Albert, of Sedan; Mabel Clair TRIPP of Sidler, Okla; and two daughters, Cleo May, who died in childhood; and Carrie Isabel HAMPTON who preceded her mother in death a few years ago. She, together with her husband, united with the Methodist Episcopal church in Kay County, Oklahoma in 1897. She later transferred her membership to the Methodist Episcopal church of Sedan, where she was a member. She was a member of both the Rebeckah and Eastern Star Lodges. Besides her companion and children, she leaves to mourn her death, two sisters, Mrs. Mary TRIPP and Mrs. Martha THOMAS, both of Pawhuska, Oklahoma; eight grand-children and two great-grandchildren, and a host of other relatives and friends. She was a loving wife and mother and a friend to all who knew her. Funeral services were conducted at the United Brethren church at Chautauqua, Kansas, at 3:00 o’clock p.m., Sunday, December 29, 1935, with Rev. Howard C. BENTON officiating, assisted by Rev. WILSON. A mixed quartet composed of Misses Dorothy TULLOSS, Inez BUTTERFIELD, B. J. FUNK and T. E. HESS, rendered the following numbers: “Asleep in Jesus,” “In the Garden” and “The City Foursquare.” They were accompanied at the piano by Mrs. J. O. TULLOSS. A short memorial service was conducted by the Easter Star Lodge at the church. The pall-bearers were: Arthur BRUNGER, G. K. CROCKETT, C. M. HUNT, J. M. GWALTNEY, Wm. BRUNER and A. B. COOVER. Those from out-of-town attending the funeral were: Mr. and Mrs. F. B. TRIPP and daughter, Georgia, of Shidler; Mrs. Mary TRIPP, Mrs. Martha THOMAS, and Mrs. Nannie WHITEHORN of Pawhuska; Mrs. Adda MCWHIRT and Mr. Harry MCWHIRT of Hominy; Mrs. Hattie MOORE of Oklahoma City; Mr. and Mrs. Ralph SPRAY of Catoosa, L. C. MCKENNEY of Ponca City; Thelma MCKENNEY of Wichita; Mr. and Mrs. Paul BLAKE of Shidler; Mr. B. COOK of Kaw City; and Mr. CAMPBELL of Ponca City. Interment was in the Chautauqua cemetery with Baird Funeral Home in charge. 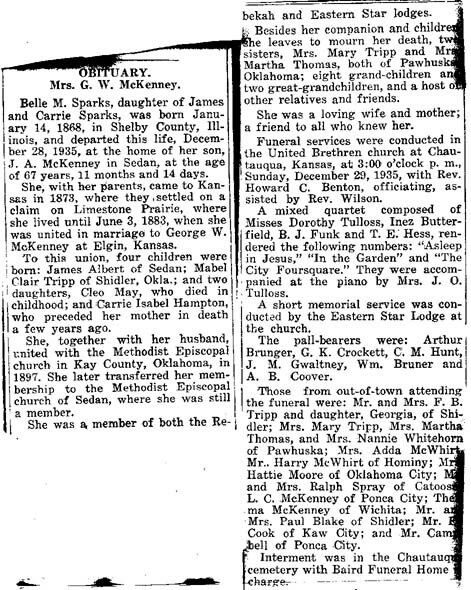 It may be incorrect but Mabel Claire’s obituary gives the family as having moved to Pawhuska OK when she was young, which would have been in Osage Indian Territory. But Belle’s obituary places them in Kay County, next to the Osage Indian Territory, in 1897, the year Carrie Isabel was born.